The education of Ireland is considered across the world for providing excellence in all disciplines. 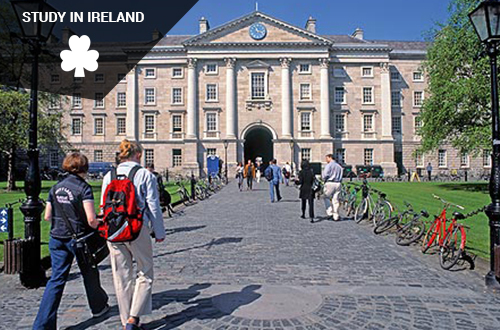 Some of the world’s top and best institutes are located in the Ireland. The country has a great reputation for offering quality of education to its students. Irish education is one of the best in the world. Ireland is also renowned for its welcoming and friendliness attitude. It offers top-class of education and has rich cultural heritage. There is range of options for international students choosing to study in Ireland as a Student. You need to choose right and relevant course for your study visa Ireland application to be successful. There is a wide range of courses available and international students may choose according to their career pathways. International students in Ireland on a degree program can work for 20 hours per week. During months of June, July August September and 15 December to 15 January they may work for 40 hours per week. Under the Third Level Graduate Scheme international students who have completed a qualification may stay in Ireland for 2 Years and look for a job. During this 2 years time under this scheme you may work for 40 hours per week. Ireland is very particular about the documentation provided along with the student visa application for Ireland. You need to address each and every aspect minutely for your study in Ireland application to be successful. If you have any gaps, they need to address. Your course needs to be relevant and show clear study progression. At West Highlander we assess your student visa Ireland application very minutely and prepare a customised checklist which increases the success rate of your application. We are Education UK certified Counsellor and ICEF Trained Agent Counsellor and member of NAFSA. We are also an ICEF Accredited Agency. Major intakes: Jan, June & Sept., but Some colleges do also have rolling intakes Please Check individual College website for exact intakes. Primary Education: It is for 1-8 years. Tertiary Education: it consists of Universities, Colleges of technology, colleges of education and independent colleges. This information is correct at time of publication, to find out more about the fees at chosen institution please use the course directory on the website of Colleges directly. As per requirements of Ireland High Commission, the cost of living is Euro 7000 per year. Clear transparent, time effective admission & visa process. On completion of higher studies, students may stay on in Ireland for six months to allow them time, should they so wish, to seek employment and apply for a work permit. Part time job (20hrs weekly) helps to understand working culture & environment of developed country. Information about how to apply to study, and prepare for living in Ireland. Information about tuition fees and cost of living in Ireland. West Highlander is a leading study abroad immigration consultancy in Chandigarh with many years of experience of study in Ireland. The expertise & experience of West Highlander team makes your study in Ireland dream come true. West Highlander is the best consultant in Chandigarh making your process of study abroad a smooth and an easy experience.